Soft and soothing. This basket is overflowing with pastel flowers and your sincere message of hope to those in mourning. 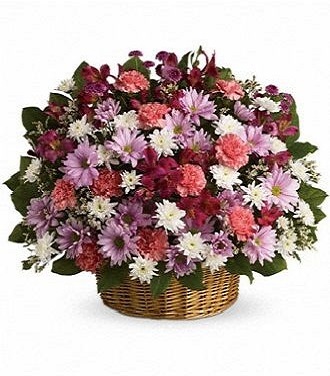 Beautiful flowers such as pink carnations and alstroemeria, lavender button and daisy spray chrysanthemums along with white cushion spray chrysanthemums and more fill a lovely round wicker basket.